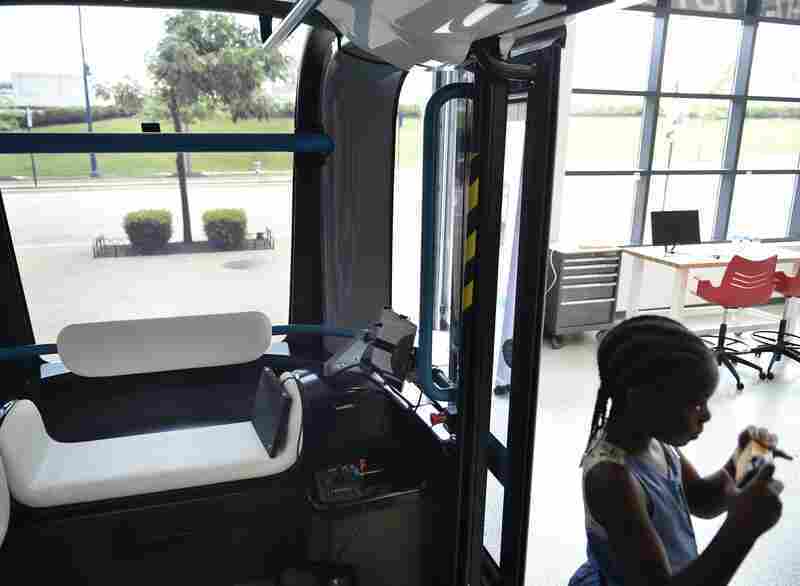 A 24-Year-Old Designed A Self-Driving Minibus; Car Maker Local Motors Built It In Two Weeks : All Tech Considered What if cars weren't mass produced? Local Motors, a small-batch auto manufacturer, relies on an online design community and a "co-creation" business model to bring new vehicles to market, really fast. Edgar Sarmiento won the Local Motors challenge to design an urban public transportation system. His self-driving electric minibus design eventually became this vehicle called Olli. 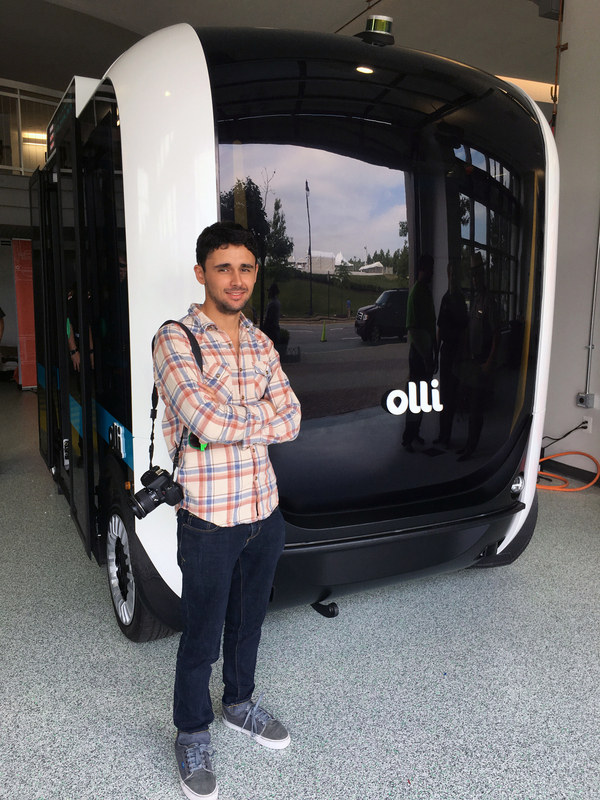 At the recent unveiling of a new self-driving shuttle bus called Olli, its designer sat perched on a stool nearby, his hands cradling a camera in his lap. He and Olli had just met several hours earlier. Edgar Sarmiento is now 24. In 2014, he emerged into the workforce in his native Colombia with a degree in industrial design. He found work, at a design agency in Bogota, but it wasn't satisfying. "The problem in Colombia is that product design, it's not as strong," Sarmiento says. "When industrial designers start working in the field ... you start to work in graphic design, in publicity, in interior design." So he went exploring online and found himself in a digital design community run by an Arizona-based carmaker, Local Motors. Best-known for its 3-D-printed car, the company relies on people like Sarmiento to bring brand-new vehicles to market in a matter of weeks — a business model driven by co-creation (a cousin of crowdsourcing) and micromanufacturing (a cousin of small-batch, locally sourced production). 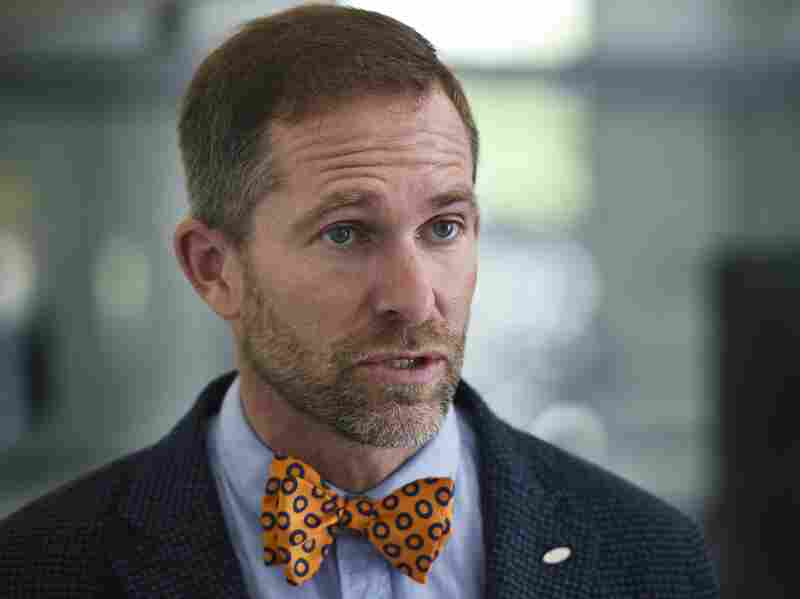 "We want the fastest speed to a good idea commercialized in the market; we want to be the maker; we want to sell it and service it out of our factory," says Local Motors CEO John B. Rogers Jr.
Rogers' first big idea was building up localized and digitized made-to-order manufacturing, powered by 3-D printing, to unleash the so-called economy of scope, an antithesis to the economy of scale. John B. Rogers Jr. is CEO and co-founder of Arizona-based Local Motors. "High volume, low pricing power, low cost, low margin — that's what Toyota or Hyundai have done very well with the automotive industry," Rogers says. His sights are on low volume, high price, low production cost, high margin: "My economy comes from being able to drive up my price because I can introduce new technology and get you to pay more because it's not available on another vehicle." Rogers says his aspiration is to create a million vehicles, "each one of a 20,000-unit run, where I'm profitable on a hundred vehicles in each of those runs." But how do you churn that many vehicle ideas, fast? Hiring a team didn't seem efficient — appealing to the Internet's hive mind did. So was born the Local Motors co-creation community. There, the company hosts challenges and competitions for designs of land and air vehicles. "Most of our vehicles are designed by people who don't work for us," says Justin Fishkin, chief strategy officer. "We haven't used an idea from a 6-year-old yet, but I bet you in the next decade, there will be an idea from a young person that ends up in one of our cars." What the designers get in return are royalties: a winner's payment, plus, if the vehicle gets commercialized, a 1 percent to 2 percent royalty off the top price of each item sold. Rogers' plan is to also split another 1 percent to 2 percent among key community members who help improve the design. So far, Local Motors has produced fewer than a dozen vehicle models, and only a few have been truly commercialized, including the now-discontinued $1,500 electric tricycle Verrado (1,500 sold, according to Rogers) and the $100,000 Rally Fighter (100 sold so far, he says). 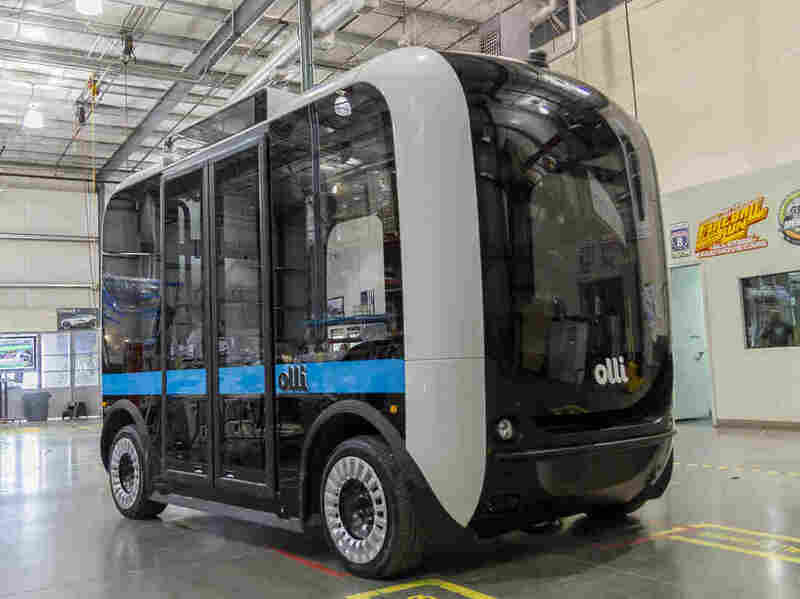 Olli is an autonomous electric shuttle bus by Local Motors that is test-running at National Harbor, south of Washington, D.C.
Olli is Local Motors' latest. And it's different: It's a self-driving system rather than a vehicle, an app-solicited shuttle bus powered by the learning and predictive computer technology of IBM's Watson — all targeted at cities or companies rather than individual buyers. 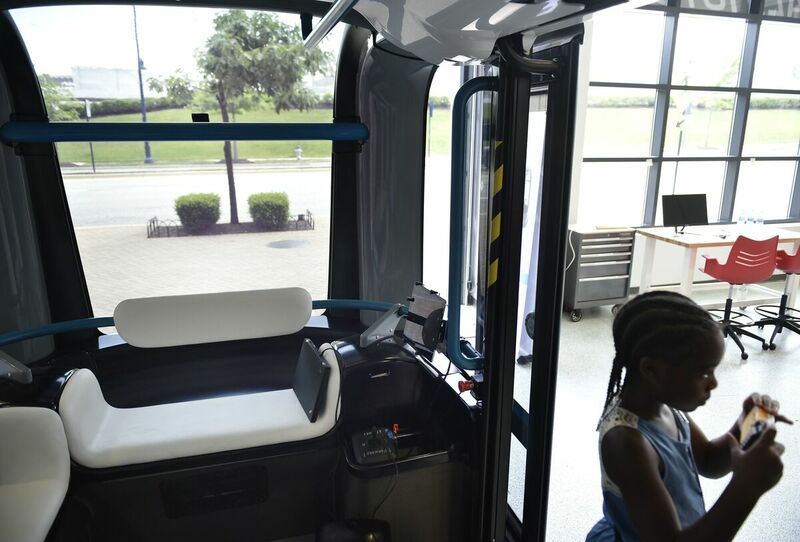 Some 100 partner companies helped make Olli a reality. But before the curvy, puffy reversible minibus became Olli, it started as a boxy sketch and was at one point called "Edgar 8," after its designer. "This is the first time that I see a product that I designed, to see it in a real scale," Sarmiento says. He has designed a few dozen products and placed in other competitions before but had never seen his creations produced. Last he had seen Olli, it was a 2-foot-long, 3-D scale model. A dozen people can fit inside the Olli minibus. Cognitive technology from IBM's Watson will talk with and learn about passengers, hoping to predict their needs or reactions. "For a long time," he says of his first real Olli encounter, "I was looking, analyzing, I can't believe that it's real." But no crying. "Not much," he says, laughing. Rogers says that from the moment Sarmiento's winning design challenge entry was green-lighted for production, it took Local Motors 2 1/2 months to line up the suppliers, finish the design and get going on 3-D-printing of the parts. "From the time when we put all the parts on the floor and said, 'We're going to build it,' " Rogers says, "to build the first two, it took two weeks." "I think they need us"
The speed and the openness of operations are Rogers' points of pride and what distinguishes Local Motors from any other carmaker or tech company venturing into self-driving vehicles. Local Motors is not like Porsche, he says, with secret testing tracks and big reveals at auto shows. It's not like Google, which claims self-driving fame but doesn't make actual vehicles. And it's not like Apple, known for being secretive, autocratic and engulfing in its partnerships. "We will share with our community to the end," Rogers says, "till we die." It's also not like Tesla. "They built a very expensive factory," Rogers says, and spent years building the Model S, followed by the upcoming Model 3. "But Local Motors is making vehicles with better autonomous technology right now and putting them at low volume in the market." "In a sense, I think they need us," he argues, referring to Google and Tesla. As a low-volume, high-margin maker, Local Motors "pierces the market" and moves on, he says, leaving it up to the rest to carry the innovations through. "We make it clear what people want," Rogers says. He says his company did approach Google for a partnership, to put Google's self-driving technology into Local Motors cars. "So far they haven't said yes," Rogers says. "And I think now that we see so much interest from so many other companies, I'm not sure how useful partnering with Google would be." Local Motors says so far, it has secured orders for 10 Olli shuttles and has paid Sarmiento $28,000 in total, for winning the challenge and for his design making it to market. Sarmiento, who is now studying transportation design in Italy, will later receive additional royalties, though the amount is unclear as the company isn't disclosing Olli's price. The original Olli is being test-run this summer around National Harbor, south of Washington, D.C.